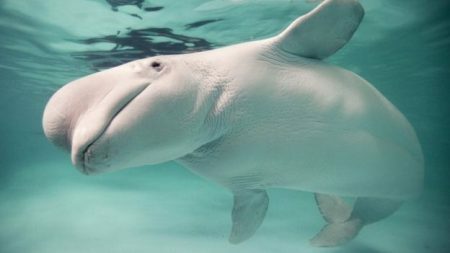 A beluga whale has been seen swimming in the River Thames. It was first spotted by ecologist and ornithologist Dave Andrews, who said it had been feeding around barges near Gravesend in Kent. The Whale and Dolphin Conservation said it was “obviously very lost and quite possibly in trouble”. Vessels are being kept clear, with the British Divers Marine Life Rescue urging the public not to get too close and “to watch it from the shore”. Tanya Ferry, environment manager at the Port of London Authority which is monitoring the whale, said it was unclear what the whale could eat. “If they are eating things like jellyfish, we don’t tend to have a great deal of jellyfish in the Thames, but we do have quite a lot of plastic bags, which could be quite an issue,” she said. “We’re hoping if we give it enough space and keep an eye on it, it will find its own way out of the Thames to an environment that’s more appropriate for it. Conservationists hope the outgoing tide will take it to safer waters. 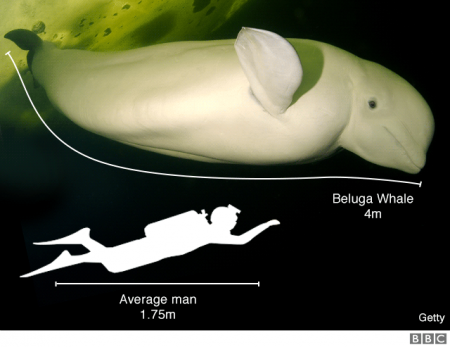 Beluga whales were last spotted in the UK three years ago off the coast of Northumberland and Northern Ireland, but sightings were “extremely rare”, British Divers Marine Life Rescue spokeswoman Julia Cable said. She added the animal was “swimming strongly” and it would hopefully swim back out to sea. Whale and Dolphin Conservation Society spokesman Danny Groves said as the whales were high Arctic species, “this one is thousands of miles from where it should be”. “We would urge that the whale is given space and disturbance is kept to a minimum,” he said. The RSPCA said it was aware of reports of a whale in the Thames. “We are working with other agencies to monitor the situation and ready to provide appropriate assistance if requested,” it said. Report and photos courtesy of the BBC. Mark. Would you do me a favour and show this post to Bryn please?